I’ve been obsessed with Pinterest for many years, but about a year ago I started realizing just how powerful this platform is for bringing traffic to my blog and business websites. I’ve spent countless hours combing through tons of studies, articles, blog posts, courses — you name it — and finally, after a lot of experimenting, developed a system that works best for my brands and brings me consistent website traffic on a daily basis. While there is a lot to talk about when it comes to using Pinterest to increase your website traffic (some of which I talk more about in my free five-day workshop), one of the tools that I simply cannot live without when it comes to using Pinterest is Canva. Canva is an online tool that I use to create all of my blog and Pinterest graphics. I have a Canva for work subscription, but you can also sign up for a free account if you don’t have one already. Not only does Canva provide canvas sizes that are already perfectly formatted for Pinterest, but they also have pre-made templates to choose from if you’re not feeling super creative, or simply don’t have the time to create your pins from scratch. I’ve spent a lot of time playing around with different styles, colors, fonts and images to create pins that convert (meaning, pins that get actual clicks through to my website, not just impressions or saves), and have learned a lot about what works well, and what doesn’t work so well. To help make your life a little easier, I created 10 Pinterest templates for you to use with Canva. All you have to do is click here to grab them for FREE! There’s even a quick tutorial I’ve recorded for you so you can see how to customize the colors, images and text to fit your brand. Add a soft call to action as a text overlay (the words you see on the image) to entice users click through to your website. You want to include just enough information on the pin that will grab the attention of your audience, but not too much information that they’ll just save it or scroll on by. Experiment with colors and typography styles that suit your brand but also appeal to your audience. Not sure which colors or typography combinations work best? Create a few different options, publish them to Pinterest, and track their analytics over the next couple of weeks to see which pins are performing better than others. Use that information to help you create your future pins! Remember to focus on the number of clicks your pins are getting, not the impressions. Use stock images from Unsplash or the ones in Canva to spruce up your pins. You can do a quick search within Canva or on Unsplash to find your images. Don’t forget to utilize pin descriptions! Please promise me that you’ll never leave the description box blank! This is a great area to really optimize your pins for search. You’ll want to include a couple complete sentences with keywords to target your audience (avoid stringing a bunch of keywords together in random order) and don’t forget that you can utilize up to 20 hashtags in your descriptions. Quick tip: If you’re not sure which keywords to include in your descriptions, enter in a couple words in the search bar on Pinterest that are relevant to your brand and see what comes up! If you want to learn more about how to use Pinterest to drive traffic to your website, you can sign up here for my free five-day Pinterest workshop. In this training, we take a deep dive into your brand and I lay down all the basics you need to know to get started with Pinterest. Plus, I’ve included some free bonus goodies in the training to help you get the most out of the lessons! If you have any questions about your templates or the free workshop, you can join the free virtual community here and get in touch! Happy pinning! Pinterest is my number one source of traffic across all of my websites. Once I started taking consistent and strategic action to grow my brands through Pinterest, my website traffic more than tripled in just one month of getting serious with my business account. When I speak with clients or readers on social media, they always ask me the same thing: How!? They usually follow up this question with asking me one or all of the following: Why do I need to use a business account? Can’t I just pin from my personal profile? Is this going to take a lot of extra time? How long will it be until I start seeing the growth I’m after? This is the first thing I do for my clients when they hire me as their Pinterest Assistant. Creating a new business account, or converting your personal account, grants you access to a whole new world on Pinterest (and it’s free). Setting up or converting to a business account will not only allow you to create viral-worthy pins that link your audience back to your website, but it will allow you to monitor your Pinterest analytics. You’ll be able to see how your pins are performing and which ones are being saved and how many people are clicking on them to go to their original source (your website). These analytics will give you exclusive access to the behaviors of your current and target audience. Having access to this information may not seem like a huge deal, but if you want to learn how to truly grow your brand on Pinterest it’s important to pay attention to what the data tells you. A lot of people will ask me if they can just pin images directly from their blog or website to their personal Pinterest, rather than setting up a business account. Of course that’s certainly one way to go about it, but resisting a business account isn’t going to do you much good, plus it literally takes just a few minutes to set up. If you want to learn more about why and how to set up your business account you can take a look at this post here where I get into the details, or you can have me set up your account for you. If you’re a health and wellness blogger, does it make sense for your audience to see your “Dream Wedding” board when they visit your profile? I think the answer is obvious there, yet I see so many clients making this mistake! You have a target audience that you want to attract — whether you want them to read your blog, buy your products, or utilize your services — so you need to create boards and pin images that will bring forth your target audience. If I’m browsing Pinterest and stumble upon a health and wellness profile, I expect to see boards filled with content related to their brand. If you are going to be converting your personal profile to a business account, you can easily turn some of your off-brand boards into “secret” boards so you don’t lose all the content you’ve pinned over the years. I have plenty of secret boards on my business accounts that I still pin to often, but I don’t want my audience seeing them because they don’t pertain to my niche and will attract the wrong audience. Save the dream wedding and hair color inspo boards for your personal profile or secret boards, and keep your business account specific to your niche. I think Instagram and Facebook are secretly run by Regina George (if you don’t get the Mean Girls reference you can ignore that first sentence), because it feels like they’re always working against us. I lost faith in Instagram when they got rid of the chronological feed and made it harder for people to be seen unless you spent countless hours posting, engaging and paying for ads. Don’t get me wrong, social media is still a useful tool, but I’ve seen so much more growth and conversions by utilizing Pinterest, and it all started happening within that first month I got serious with my business account. A lot of people have what I call social media syndrome when they start working on their Pinterest account — they think that followers are the end all and be all, and have this belief engrained in their minds that if their follower count isn’t going up on Pinterest they aren’t growing. Well my friends, lucky for us, that couldn’t be further from the truth! What matters most on Pinterest is that people are seeing your pins, saving them to their own boards, and clicking on them to land on your website. Those are the numbers that matter. Your audience doesn’t have to be following you to see your content — they just have to see it in a search or on their feed. Sure, it’s nice to see your follower count increase but it’s not a critical measurement of success. Pinterest is not a social media platform: it’s a visual search engine. Think of Pinterest like Google, but with pictures. When you go to Google you enter certain terms into the search bar and Google pulls up a ridiculous amount of resources that are relevant to your search. Pinterest does the same exact thing but with pretty images. How and why do those images show up in your search? It’s all in the descriptions. This is another huge reason why you don’t want to just use your personal account to pin images from your website. Those images may very well be pinned without any type of relevant or searchable descriptions, which means your audience could be missing out on finding your content. Every time you upload your own image to Pinterest, you have the opportunity to craft a description that will hopefully show up in your target audience’s search results. This requires a little strategy on your part, so let’s take a look at some examples. Even looking back at that description there are some things I would change to make it even more searchable, but you get the idea. You want to imagine what your ideal reader, customer, or client would search for when coming to Pinterest (or Google), and try to include some of those keywords in the descriptions of your pins and your boards. This is how your content can end up on the screens of your target audience. Please, please, please promise me though, you won’t just jam a bunch of keywords into your descriptions. Write out a couple sentences, put some effort into it, then end with just a couple hashtags if you feel so inclined, but don’t just type out random terms or hashtags and throw them in the box. If you’re stuck on what to say in your description and aren’t sure how to really optimize your pins or boards, think about who your target audience is and what they might be searching for to arrive at your profile. Think about your brand, your content, your products, or services. Once you get used to writing descriptions, you’ll get the hang of it. This last mistake is a BIG one. I’ve talked about Tailwind before and how much I love it for running my Pinterest and Instagram on autopilot. It’s also a huge reason why I was able to triple my website traffic in just one month of consistent and strategic use in conjunction with Pinterest. If you haven’t seen the post I mentioned above, Tailwind is a Pinterest-approved scheduling tool that allows you to create and schedule pins that will automatically pin to Pinterest at the most optimal times. You can literally schedule out weeks worth of content and save SO much time since you won’t be stuck pinning aimlessly at odd hours. You can even join Tailwind tribes (general or niche-specific groups within the tool), to share your content in order to help get re-shares, drive traffic, and add additional content from other users to your boards. I use Tailwind for all of my clients and it just makes everyone’s lives so much easier. You can learn more about Tailwind by checking out this post, or if you’re ready to dive in and see what it’s all about you can sign up for your account and get started using it today. If you find that you’re making any (or all) of these mistakes with your Pinterest, don’t stress! They are relatively simple fixes that make a massive difference. If you’re still struggling after making some adjustments, you can check out my Pinterest services here and I’ll be more than happy to help you out! Stay tuned for my special project announcement that will provide you with even MORE Pinterest help! Enter your email below to receive your free four page quick guide, complete with essential tools and checklists to start driving more traffic to your website! We promise we won't send you any spam. Unsubscribe at any time. Okay so by now you probably know my obsession with Pinterest. It's become SUCH an obsession that I started offering Pinterest Management services to other bloggers and business owners who are ready to seriously increase website traffic, and in turn, increase sales on their products or gain clients for their services. One of my secret weapons for getting the most out of Pinterest is using my favorite Pinterest-approved scheduling tool: Tailwind. When I get asked by clients, friends or followers how to increase their blog traffic my number one recommendation is PINTEREST. Not your personal Pinterest account but a Pinterest BUSINESS account. Setting up a business account will not only allow you to create viral-worthy pins that link your audience back to your website, but it will allow you to monitor your Pinterest analytics. You’ll be able to see how your pins are performing and which ones are being saved and how many people are clicking on them to go to their original source. Although I proofread my posts before I hit publish, I always read them over again as a “reader.” Something about seeing the post through a reader’s eyes allows me to catch any mistakes or formatting issues. I keep a separate tab open that I can go to and edit right away, so once I’ve made any necessary changes I save the post again. Make sure you have any relevant links, images, videos, etc. placed and ready to go. I usually proofread once or twice after publishing just to be sure! 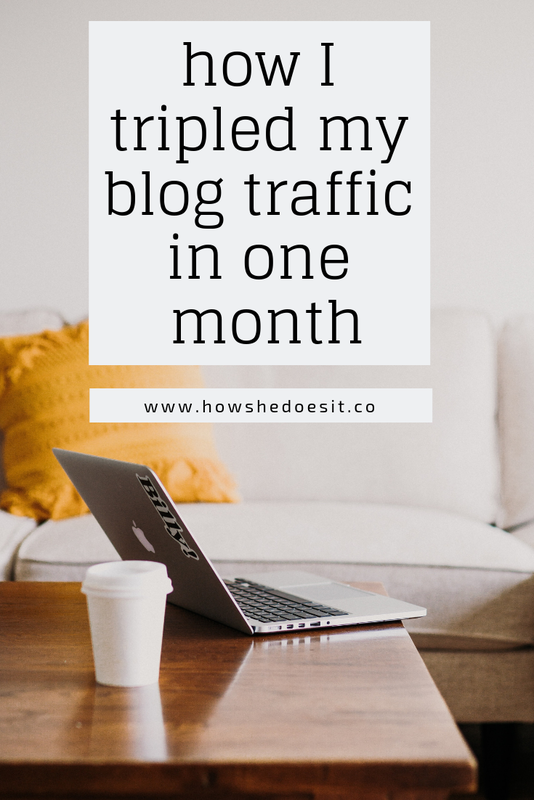 In my last post I talked about how Pinterest has helped me triple my blog traffic in just one month of blogging. The way I use Pinterest to increase traffic is by creating pins that link back to specific posts or other content on my blog. I typically create 3-5 different pins per post using Canva and stock photos from Unsplash, Ivory Mix or other stock photo sites. For my favorite free stock photo sites you can see the full list by taking a look at this post. Canva makes it so easy to create Pinterest graphics. You can start completely from scratch or you can use some of their pre-made templates to help get you started. I recently updated my tutorial on how to create pins in Canva, so if you’d like to learn how to DIY your graphics, you can watch the quick tutorial I recorded below. If you want to completely outsource your Pinterest work, you can check out my Pinterest Management services here. Once you’ve created your pins you can upload them straight to Pinterest, or you can use a scheduling tool like Tailwind. Tailwind is incredibly helpful for ensuring your scheduled pins are posted at optimal times, but it’s also great for increasing traffic to both your Pinterest account and your blog. You can join Tailwind Tribes relevant to your niche and add your new pins to those groups in hopes that your pin will be seen and re-pinned by the other members of your tribe. I’ll be doing a full post on Pinterest and Tailwind soon, but in the mean time you can start using Tailwind today by signing up here. I am a huge believer in “less is more” when it comes to social media platforms. I like to stick to Pinterest and Instagram for the most part. If you try to focus on Pinterest, Instagram, Twitter, Facebook and YouTube all at the same time — especially as a new blogger — you’re going to get super overwhelmed super fast. Pick one or two and start there. All the links for my blog are included in my Instagram bio, and I usually hop on stories to let my followers know when I have a new post up. If I post a new photo that day too, I might mention it in the caption as well. Regardless of your preferred platform, make sure you’re telling your followers about your new post, and make it easy for them to view it when it goes live. Joining Facebook groups for bloggers was another huge reason I saw such a large spike in traffic last month. You can join general blogging groups, niche groups, or groups for new bloggers. Most of these groups post consistent threads that will allow you to link a specific blog post a couple times a week (or sometimes daily), so be sure to keep an eye on your groups for these opportunities. Two of my favorite groups are Boss Girl Bloggers and Grow Your Blog. I’ve seen a lot of growth since I joined the two groups, but I’ve also made so many great connections with other bloggers, and have learned a lot about blogging in general! I’ve been working quite a bit on growing my email list lately, so I don’t have a TON of information to share with you just yet, but your new blog posts can absolutely be used as content in e-mails to your subscribers. If you send weekly or monthly e-mails, you can let your subscribers know about your latest updates, and even share short excerpts of new content with links to their original posts. This is a great way to keep driving traffic back to your blog and keep your subscribers in the loop. While this all certainly DOES take a bit of time, it is doable and 100% worth it. 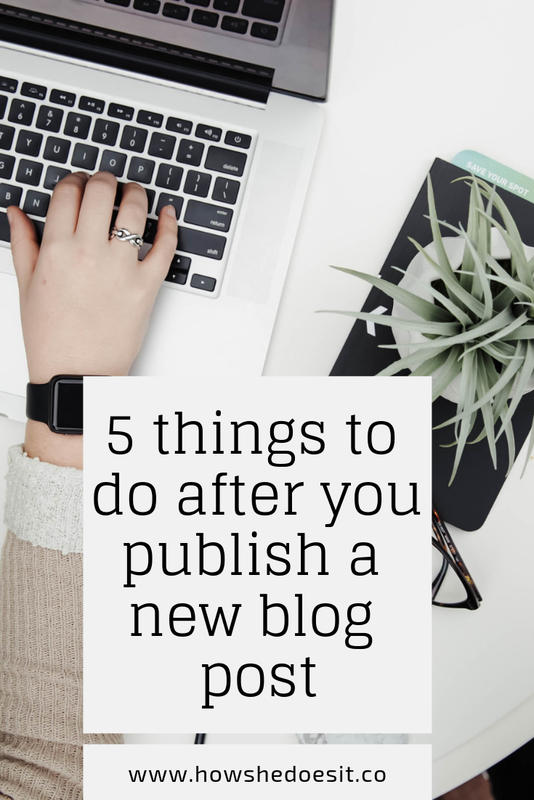 Once you get used to setting up your post-publishing routine, it becomes much quicker and easier to put the finishing touches on your newly published content. If you need help getting started with creating pins, finding groups, or any of the above don’t hesitate to ask! Let me know if you have any additional tasks you take care of after publishing a post! Throughout the years I’ve had several blogs about various topics, but none of them stuck for very long. I never posted consistently, and would go months in between posts. This time around I knew I wanted to write about things I was passionate about and focus on actually growing my blog. I can’t stress this enough. Whether you decide to post once a week, twice a week, or three times a week, it’s important to remain consistent. Going weeks or months without posting anything certainly isn’t going to help increase traffic. The other piece to this, though, is providing quality content and not just posting for the sake of posting. You want to make sure you are providing your readers with well written, thoughtful content that isn’t just being slapped together — really take the time to write your posts and produce something of quality. Being active on Pinterest has been a total GAME CHANGER. Once I figured out what my domain name would be here, I made sure to sign up for a business account with Pinterest (if you haven’t done this yet, go do it right now!). This allows you to set up rich pins, link back to your blog or website, and see how many people are viewing and pinning your content. My monthly views on Pinterest continue to increase (more on that later), as I stay active uploading my own pins and re-pinning relevant content onto my boards. I sign in to my Pinterest to do this all the time but I also use Tailwind to schedule pins and post to a few different tribes. This saves me SO much time and is such a helpful tool for growing your Pinterest. I’m working on a post all about Pinterest and Tailwind, but for now you can sign up for Tailwind here. You can also learn more about my Pinterest Management services if you want to learn how I can help you with your Pinterest. A lot of what I read about growing your blog tells you to focus on one or two social media platforms so you don’t overwhelm yourself. I personally focus on Pinterest and Instagram. While my Instagram is still a work in progress (figuring out a cohesive feed can be soo frustrating), I post there daily, use my stories and comments to connect and engage with my followers, and make sure my blog is linked in my profile. I get a decent amount of traffic to my blog from Instagram, and make sure to let my followers know when a new post is up. Don’t ignore your readers! After all, they are supporting your work when they visit your blog and read your posts. When someone comments on a post I always make sure I take the time to respond. I’ve also recently set up an account through MailChimp so I can start building an e-mail list to connect with my subscribers and let them know about new posts, updates to my design shop, and share more content. I use MailChimp for my business and find it easy to navigate and schedule emails to customers, clients and readers. Besides Pinterest, this has been a huge reason I’ve seen growth here. I’ve joined a handful of Facebook groups for bloggers and it’s not only helped increase traffic on my blog, but it’s helped grow my Instagram too (I’m not a fan of Instagram pods, so Facebook groups are my preferred option). I’ve gotten to connect with so many other amazing bloggers and have learned so much about blogging through these groups. You can search on Facebook for “new blogger” groups or blogging groups pertaining to your niche. A lot of them post threads daily or weekly that will allow you link back to your blog, Instagram, Pinterest, Facebook, etc. You usually have to engage with others who post their links as well, but this is a great way to find other blogs and accounts. Not only does it help your blog, but you help others grow their blogs as well! One thing I wish I would’ve done right off the bat when I started my blog was link to Google Analytics. I did that recently, but it would’ve been so helpful to have done that in the first place. Squarespace does have an analytics tab, though, so I’m still able to track my traffic from there every day too. The first image below is a screenshot of my analytics from September and the image below it is from October. You can see below how my blog has grown from the beginning of September to the end of October. While I realize these numbers are small in comparison to some other bloggers who have numbers into the thousands and ten thousands, I’m excited that I was able to more than triple my traffic over the course of a month! I’m planning on sharing my analytics every month so you can see how what I’m doing is effecting my traffic. If you have some great suggestions for how you’ve increased your blog traffic, I’d love to hear them! I’m looking forward to seeing how my blog grows this month and sharing that with you! Long gone are the days that Pinterest was only used for viewing pretty photos and finding inspiration. While this incredible platform is certainly still used in those ways, Pinterest has become an undeniably helpful tool for bloggers and business owners to grow their brands and drive traffic to their websites. Growing your brand and your Pinterest can be so gratifying and fun but it’s not easy! It takes a lot of time, hard work and patience; just like anything else involved with starting a new blog or a business. But my hope is to lay out a sort of formula for you that I am currently following for my Pinterest accounts in order to inspire you to try the same for yours. If you want to give your Pinterest a makeover but don’t have the time to learn how, you can see the Pinterest services I offer here. If you’ve been here for awhile you know how I feel about the word niche, (I prefer to call this your “content area” instead). I think it’s really important to keep your “theme” in mind when creating your Pinterest boards for your brand. If you are a health and fitness blogger, I would absolutely expect to see several boards designated to different subtopics in this area. Same goes for fashion bloggers — I would expect to see boards geared towards fashion trends, outfit inspiration, and a reflection of your personal style. If you’re a natural skincare brand I would hope to see your products, tips for taking care of your skin naturally, and maybe even some clean foods to eat to help your skin. Is this starting to make sense? While I feel you can certainly sprinkle in some more personal boards throughout, you’re going to want to make it very clear to your visitors and followers what your brand is about. Think about the last time you visited a Pinterest profile — were you able to tell what their blog or business was? Keep that in mind as you create your boards. Obviously you’ll want to keep adding to your boards to really build them up — I’ve seen so many recommendations regarding the suggested number of pins per board; the number I’ve seen most frequently is about 50 pins. This is something I’m currently working on — some of my boards have well over 50 pins, while others have less than 30 (yikes) — so I will update you when this is completed to see if this helps with growth! I never used to pay attention to any of the text surrounding the images on Pinterest, let alone the board descriptions. However, as I started read more about Pinterest and use it more frequently, I realized just how important it was to create/update the titles and descriptions of your Pins and your boards. Your words are essentially the keywords people could potentially search for on the platform, which means if you’re using the right keywords, it’s more likely your content will show up on someone’s feed. Your wording should be clear, concise, and terms that are easily searchable. It’s best to avoid puns, odd spellings or phrases in your titles and descriptions, as these may not be found as easily as clear descriptors. I’ve you haven’t noticed by now, I am absolutely obsessed with Canva. I’ve been using it for nearly two years to create graphics for my business, and now my latest blog. I’ve put together a couple simple tutorials you can view to help you create your own pins in Canva, and how to upload them onto Pinterest. This will come in handy when you want to create your board covers as well. My recommendation to you, once you’ve created a few pins, is to create one or two more variations of those same pins to also upload to Pinterest. I’ve been playing around with this lately and it’s helping me determine which pins are more visually pleasing. This requires SO much work but I find it to be so much fun! Similar to creating your own custom pins, you will want to create your own board covers as well. There are endless options as to how you can design your board covers, but my favorite tool is of course Canva. I will be adding a full tutorial on how to create and upload your own board covers here shortly, but you can certainly refer to the custom pin tutorial to give you an idea! Creating your own board covers makes your Pinterest look sleek, seamless, and organized. Take a look below at my brand’s boards in the top two photos (without custom board covers) and my blog’s board in the bottom two photos. Can you tell the difference!? The custom board covers tie everything together so nicely, while the random board covers make it feel disorganized and messy. I don’t know about you, but I’m much more likely to stick around’s someone’s Pinterest if it’s easy to navigate! I’ve been using Tailwind for a little over a month now, and I have to say it’s made things a whole lot easier. I have noticed some small impacts on growth and I’ve truly enjoyed learning to navigate all the site has to offer. If you haven’t heard of Tailwind, it’s a tool you can use to schedule pins, connect with a wider audience (through groups called Tribes), and gain all sorts of helpful insights about how you’re using your Pinterest. You can use Tailwind right from their website and install the plug in on your browser, OR you get the Tailwind app on your phone to make browsing and scheduling pins even easier. Scheduling pins may not seem like it’s necessary, but it helps me save so much time and Tailwind even schedules pins to publish at optimal times for me! I’ll keep you all updated on my progress with Tailwind as I continue to use it. If you want to check it out for yourself you can sign up here. You can easily plan out a week’s worth of pins to be published for you through Tailwind. However, don’t let that stop you there. You’ll want to remain active in any Tailwind Tribes you’re part of, and check in on your insights to see if there are any adjustments you should be making. I also still love to stay active on my Pinterest account outside of this tool. I love browsing through Pinterest and adding new pins whenever I have a couple minutes to spare! Coming soon I have a super exciting announcement that will help you guys with your Pinterest, whether you’re a blogger or a business owner! I am so fascinated by this platform and the tools you can utilize to help improve and grow your brand. Do you have any tips or practices you swear by or are implementing right now to help you step up your Pinterest game? In my last post, I showed you how to create your own custom pins using my favorite graphic design program, Canva. As easy as that is to do, it’s even easier to upload that graphic to your Pinterest once it’s ready to be linked to your blog post, business website or YouTube video. Below you’ll find the short tutorial on how to upload your pin, link it to your platform, and write a description before posting it to a board of choice on your Pinterest account. As usual, feel free to reach out if you have any questions! I’ve been using Canva for quite some time now. I’ve used it to design custom logos, website banners and other graphics. I’ve even used it to create thank you cards, ebooks and freebies. More recently though, I started using it to create custom pins for my Pinterest accounts. What is Canva exactly? It’s a graphic design website that allows you to fully customize pretty much whatever your little heart desires. It’s very user friendly, easy to navigate, and anyone can learn how to use it with some practice and patience. I love their pre-designed templates, canvas sizes, and never-ending graphics and customizations. If the thought of purchasing and using Photoshop or other Adobe programs intimidates the crap out of you, Canva will be your saving grace. I’ve put together a super simple tutorial on how to design a pin from scratch using Canva. Pinterest is my absolute favorite social media platform, and many successful bloggers are praising it as the number one way to drive traffic to your blog or website. You’ll want to create easy to read, aesthetically pleasing Pins to attract your audience and this is a great way to start. If you have any questions or want to know more about having a Pin designed specifically for you, feel free to reach out! If you want to skip straight to the tutorial, go to 4:47 in the video to see how to design your own pin using Canva.